I have loved The Hobbit ever since my 6th grade teacher read the book to our class. I love the book, and I really enjoyed all of the movies. If you're a Hobbit fan, too, this giveaway is for you! Warner Home Video will give one lucky reader a copy of the latest movie in the trilogy. The Hobbit: The Battle of the Five Armies brings to an epic conclusion the adventures of Bilbo Baggins, Thorin Oakenshield and the Company of Dwarves. We loved the movie in the theater, and I'm really looking forward to watching it again now that it's out on Blu-ray. And now for some Hobbit fun! Take the quiz to find out if you have the bravery it takes to journey through Middle Earth and use the interactive map to learn some fun facts about Middle Earth. Leave a comment on this post and let me know what you found out when you took the quiz. Are you brave like Bilbo? Share this giveaway on Facebook. Make sure your post is public so I can see it. Giveaway is open to U.S. and Canadian residents, and all entries must be received by 11:59pm ET on April 20, 2015. Good Luck!! Each household is only eligible to win One (1) Blu-ray The Hobbit: Battle of the Five Armies via blog reviews and giveaways. Only one winner per mailing address per giveaway. If you have won the same prize on another blog, you will not be eligible to win it again. Winner is subject to eligibility verification. 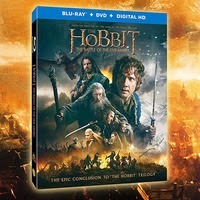 GIVEAWAY - Win THE HOBBIT: THE BATTLE OF THE FIVE ARMIES on Blue-ray!